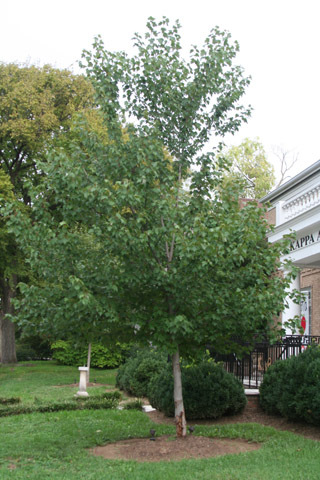 This tree is on the east side of 24th Ave. S. in front of the Kappa Alpha Theta house. The lobes of sugar maple leaves have smooth margins, in contrast to the toothed leaf margins of silver maple. The winged fruits of sugar maple are of equal size, in contrast to the fruits of silver maple. The bark of large sugar maple trees is very distinctive. It is gray, with vertical plates that are raised at the edge. Sugar maples are a common tree in forests of this area and are found in a wide variety of habitats. They are one of the most common trees in the Vanderbilt arboretum. This organism is a living specimen that is part of the  Vanderbilt University Arboretum  with the local identifier 3-366.